Little, Brown Books for Young Readers, 9780316362511, 32pp. 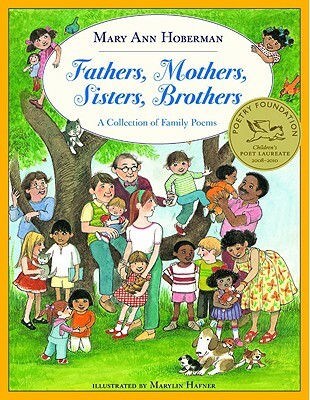 There is something for everyone in this celebration of families - poems about families of all sizes and configurations, about brothers and sisters, adoptees and stepsiblings, parents and grandparents, even a special ode to the only child. Both poems and Hafner's warm expressive illustrations convey the sense of what makes family life at once so wonderful and so unpredictable. Told from a child's point of view, the poems are perfect for reading alone or in the classroom and for family story times as well. Children's Poet Laureate Mary Ann Hoberman is the author of more than thirty-five books for children, including the critically acclaimed A House Is a House for Me, which won a National Book Award, the New York Times bestselling You Read to Me, I'll Read to You, and the Sing-Along Stories series. Marylin Hafner has illustrated hundreds of children's books, including Hanukkah!, Passover Magic, and Purim Play by Roni Schotter .